This property is under contract! Contact us now for more options! 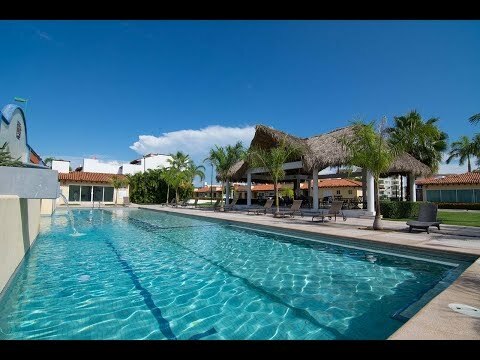 Royal Palm 12 is a luxury townhome in Royal Palm, a private gated community within the gates of Flamingos Club Residencial, located just south of Bucerias in Flamingos, Riviera Nayarit. This 4 bedroom, 3 bath home is full of luxury finishes and high end details like granite countertops and custom cabinetry in the kitchen, marble vanities, ceramic tile floors, and an interior patio complete with plunge pool which provides ample natural light to the spacious living areas. The large kitchen includes a convenient breakfast bar… and there are 2 bedrooms conveniently located on the ground floor for those with difficulty managing stairs. There is a large swimming pool and palapa as well as a gym in the common areas of Royal Palm. And the Flamingos Sport Club is just minutes away, offering its members swimming pools, a large gym, spinning, racquet sports, sauna and many other activities. Flamingos Club Residencial provides 24 hour security at the main gate, and there’s a remote controlled gate providing an additional layer of security at the entrance to Royal Palm itself. Royal Palm is close to everything… it is within walking distance of two major grocery stores, it’s just a few minutes from all the excellent dining and activities found in Bucerias’ Golden Zone and Nuevo Vallarta, and it is across the road from the Flamingos Golf Club (and two other courses are just minutes away). If you are looking for a conveniently located home in a quiet, secure setting, you’ll find Royal Palm to be a cut above the rest… priced at just $3,500,000 pesos (about $179,000 USD).